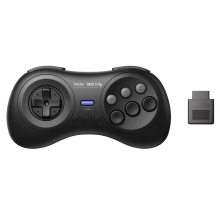 There are a M30 2.4G wireless gamepad and a 2.4G receiver for Sega Genesis Mega Drive & Genesis. One M30 2.4G controller and one 2.4G receiver. For Sega Genesis Mega Drive & Genesis. High-quality retro controller available, designed with attention and care.